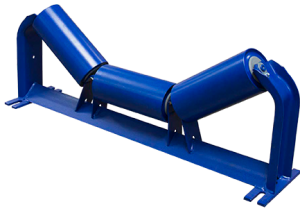 All grain and agriculture industry-specific conveyor idlers are available in a wide range of belt widths to meet customers’ needs. Order from an array of basic conveyor idlers designed from names like PPI, Douglas and Martin. These styles will not only meet most standard conveyor requirements, but exceed CEMA standards. 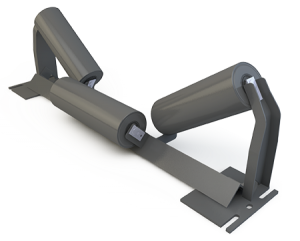 Additionally, special conveyor idlers can be designed and fabricated for your special applications. IBT will be happy to help you select the right type and combination of idlers to fulfill your grain conveying needs. Impact Idlers – Choose from our wide selection of idler stylers with the addition of rubber discs built to absorb impact and dissipate shock loads to bearings, idler frames and conveyor structure. PPI Grain idler – Designed to protect the lightweight belting that is typically used in the grain industry, PPI’s Grain Idler incorporates an offset center roll design. By offsetting the center roll relative to the wing rolls it eliminates the pinch point, protecting the most expensive piece of the conveyor system, the belt. Ehrsam Replacements – IBT has worked extensively with PPI in developing the Ehrsam Style Retro idlers now being offered. As specialists in the conveying systems field, IBT Industrial Solutions understands the importance of good systems application in achieving optimum efficiency. With our years of experience in providing conveying systems and components, you can rely on IBT for the best solution to your problems. contact Jim Boatright, the Conveying Systems Business Group Director at IBT Industrial Solutions.